The Google owned social networking site Orkut is getting much popularity in many countries, with major share of traffic from India and Brazil. Some social websites have inbuilt tools to customize profiles with icons, graphics, stylish fonts, ASCII characters, colors and many others. Unfortunately, Orkut doesn’t have any such applications. However, you might have seen your friends using stylish fonts and letters in their Orkut profiles. Now you can also enable this feature in your profile using the simple trick given below. Click here and go the Stylish Fonts and Scraps Orkut application. In the application page, you will see a button add application in the right side. Now it will take you the another page as shown above. 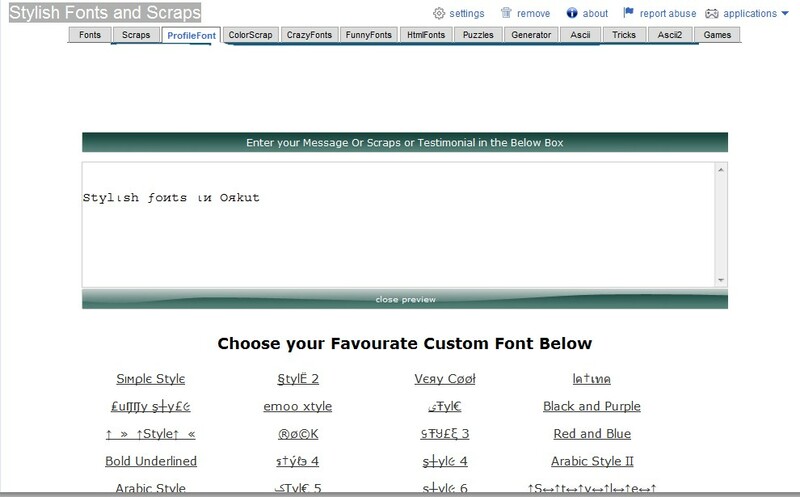 This Orkut application has tools to generate stylish Fonts, Scraps, Profile Fonts, Color Scraps, Crazy fonts, Funny fonts, HTML fonts, ASCII characters and many others. Out of the different options shown in the top tabs, select the one that you need to add to your Orkut profile. Then enter your profile name or scrap and follow the simple steps given inside the app. Then copy and paste the generated characters to your Orkut profile. The use of this application is not only limited to Orkut. You can use the generated characters and fonts anywhere you want. What you need is an Orkut account and Firefox internet browser to activate its features. patel the name is ……..
how to stylist my orkut font.. i tried many times but its not working. plz send to me stylish fonts……. stlish frofile names and fonts. 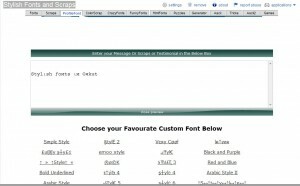 how to create stylish fonts in orkut….???????? ?